Home furnishings giant IKEA is no stranger to sustainability initiatives, including working on developing a serious amount of renewable energy, and now selling home solar systems. Perhaps to emphasize the point, IKEA recently created a marketing campaign that involved selling second hand IKEA furniture. The company first asked customers buying new IKEA furniture if they would like help selling their old IKEA furniture – that they would otherwise be sending to landfill. Unsurprisingly, there was a big response to the call-out. Together with its Norwegian agency, IKEA chose 50 people to begin working with. 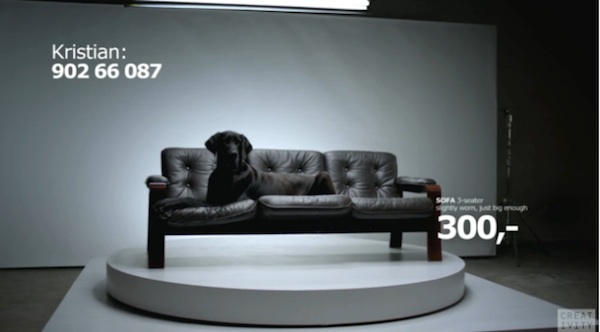 An ad campaign was created using the same production values and budget as the company’s new furniture, and the results were advertised nationwide. All the ads had the phone number of the sellers in them, so buyers could contact sellers directly. I wonder how much the sellers were paid for the likely inconvenience of having their phone numbers published across various IKEA advertising material nationwide, but I digress. In addition, during the campaign the company Facebook page was used to create a temporary online flea market, to connect more second hand furniture sellers with buyers. People could post their own used furniture between certain hours. This is all well and good, but as the embedded “Second Hand Campaign” video states at the end, “During the campaign, sales of new IKEA furniture increased, and at the same time we got our sustainable message through”. Considering the relatively small amount of second hand furniture that changed hands for the advertising spend, and the likelihood of many people selling their reusable second hand furniture online anyway, wouldn’t it be great if this wasn’t just a temporary campaign to sell more new furniture and get a warm and fuzzy “sustainable message through”. Wouldn’t it be great if IKEA set up a more permanent online market to help sell its second hand furniture? It could form part of the existing IKEA national websites. That would really be showing an ongoing commitment to sustainability.